We believe that feet are the body’s foundations and when your feet feel good, you feel good too. Comfort and quality are exactly what the doctor ordered. Our range of uniquely stylish orthopedic shoes that look as great as they feel! Our shoes, slippers, socks and inserts are designed to keep your feet healthy and happy - today and tomorrow. Dr. Comfort's shoes, slippers and socks are the best fitting, finest quality therapeutic footwear available. 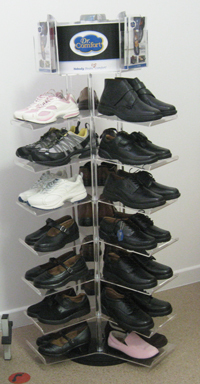 In many cases, our shoes are covered by Medicare. Heather is a Registered Surgical Chiropodist Member of The Association of Chiropodists & Podiatrists, HPC Registered G.C.S.Ch., M.Inst.Ch.P., M.F.S.Ch.